50-year-old man complains of palpitations. The rhythm includes a short burst of narrow-complex tachycardia at 150/minute certainly capable of producing symptoms of palpitations. Notice that the 3rd complex of this rhythm strip is a typical PAC with the early P wave slightly altering the T wave of the 2nd complex. What follows is a regular narrow-complex tachycardia at 150/minute with an inverted P-wave preceding each QRS complex. The rate of 150/minute raises the consideration of atrial flutter with 2:1 conduction, but in the lead II rhythm strip there is no indication of flutter waves at a rate of 300/minute. 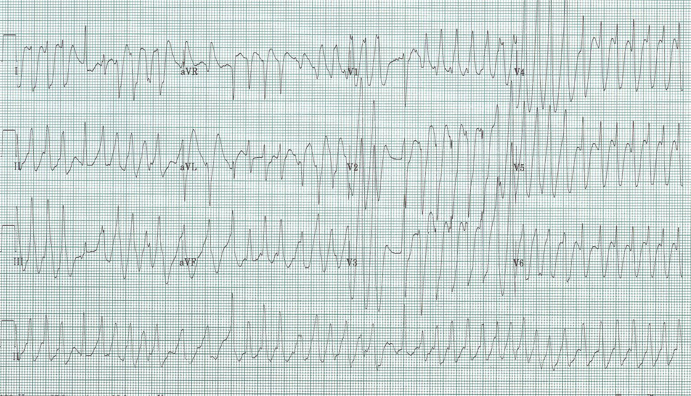 The regular, deeply-inverted P waves in lead II suggest an ectopic rhythm, and thus this short run of tachycardia is an ectopic tachycardia. 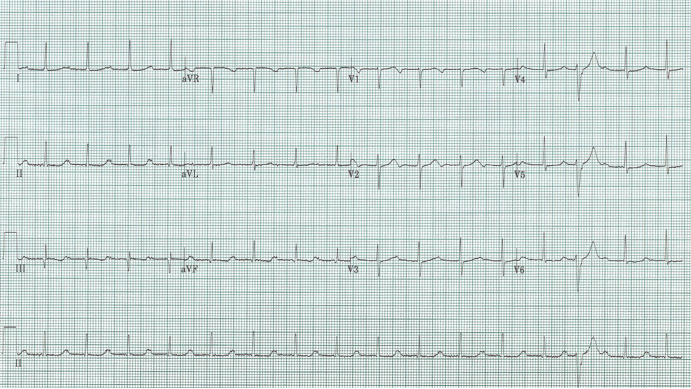 48-year-old man with palpitations and lightheadedness. This rhythm is fairly uncommon but very important to recognize. Two features of this tachycardia strongly suggests involvement of a bypass tract – 1) the extremely rapid rate with R-R intervals at a rate of 300/minute or more, and 2) the varying morphology of the QRS complexes. Treatment of this rhythm depends on the stability of the patient. If unstable, electrical cardioversion is always the right answer. This may require proceeding with defibrillation as the rapid complexes may not allow synchronized cardioversion. Amiodarone has had a controversial recent history, with removal from the 2010 ACLS recommendation following multiple case reports of deterioration due to precipitation of ventricular fib. More recently expert opinions again endorse the use of amiodarone. Another acceptable alternative, and the board exam answer, is procainamide. What is the rhythm of this routine EKG? The clue to this rhythm lies within the compensatory pause following the PVC at the end of the tracing. Notice a P-wave with a significant 1° AV block (PR of 400msec) – a complex that has actually been masquerading as a T-wave in the remaining EKG. Without this opportune advantage one might easily interpret the rhythm as junctional (absence of P-waves) with a prolonged QT interval. 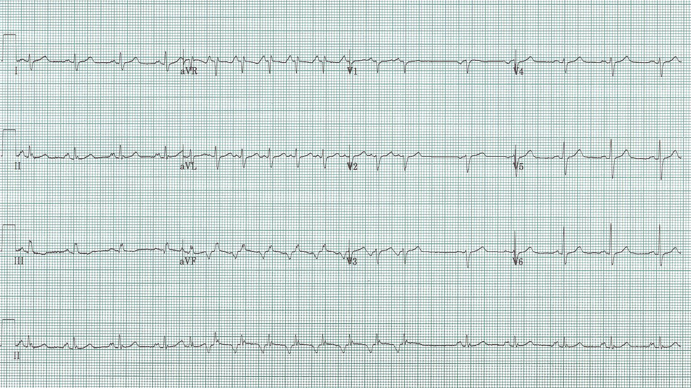 It pays to carefully scrutinize every part of the 12-lead EKG and the rhythm strip. As in this case it can truly alter the interpretation.